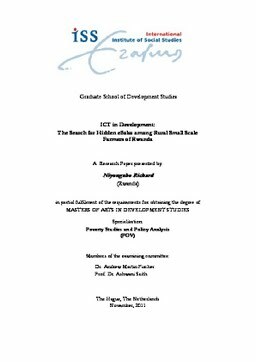 This paper, employs a qualitative research method to examine the reasons behind the design and implementation of eSoko in its current form, by who and with what interests, despite the obvious disconnections between the project and the factual reality experienced by the poor rural farmers of Rwamagana, Ruhango and Musanze Districts in Rwanda. The findings indicate that eSoko is less known to majority rural poor farmers, due to structural issues such as the low levels of literacy, inadequate ICT infrastructure, high costs of acquiring and maintaining the technology and social structures such as gender, that limit the poor farmers from accessing ICT opportunities. Such opportunities include but not limited to market information that could empower them to raise their yields, incomes and compete equally for better markets in order to improve their wellbeing. These findings indicate eSoko to be of a limited significance to farmers because it meets more of the elites’ interests and that of MNCs such as those of MTN and Voxiva, as these monopolise the functioning of eSoko system which puts the poor farmers under the risk of being exploited, yet they have no enough means and capacity to meet the costs of the services provided as compared to the political and economic elites. This might turn the project from a tool of emancipation to a tool of exploitation because from the field research, it is noticed that the whole infrastructure is owned by foreign companies, with limited consideration of domestic context where internet and mobile phone ownership is limited.